Comments: Rare and getting rarer, you might say about this 1987 release — and this is a German pressing, too. 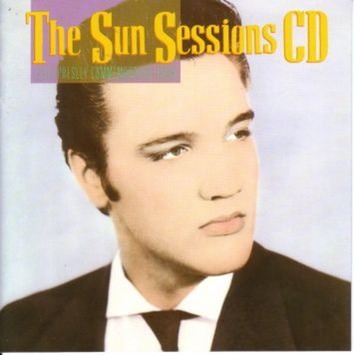 One of several attempts by RCA to present Elvis's Sun material, this one contains 16 master takes, 8 outtakes and 4 previously unreleased alternate takes. Count them, that's 28 tracks in all: That's All Right; Blue Moon Of Kentucky; Good Rockin' Tonight; I Don't Care If The Sun Don't Shine; Milkcow Blues Boogie; You're a Heartbreaker; Baby, Let's Play House; I'm Left, You're Right, She's Gone; Mystery Train; I Forgot To Remember To Forget; I Love You Because; Blue Moon; Tomorrow Night; I'll Never Let You Go (Little Darlin'); Just Because; Trying To Get You; Harbor Lights; I Love You Because - take 2; That's All Right; Blue Moon of Kentucky; I Don't Care If The Sun Don't Shine; I'm Left, You're Right, She's Gone - take 9; I'll Never Let You Go (Little Darlin'); When It Rains, It Really Pours; I Love You Because - take 3; I Love You Because - take 5; I'm Left, You're Right, She's Gone - take 7; I'm Left, You're Right, She's Gone - take 12.